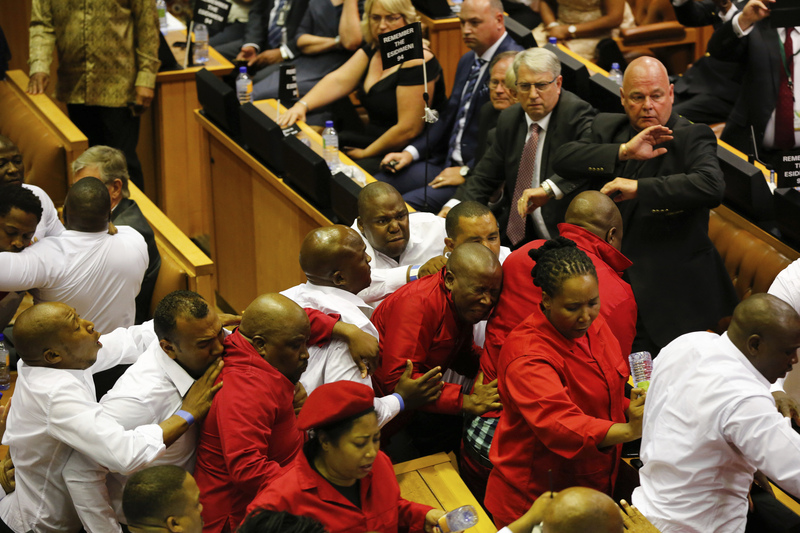 South Africa’s opening of parliament and annual state of the nation address descended into chaos on Feb. 9 when members of the opposition Economic Freedom Fighters were violently removed from the parliamentary chamber. This is the third consecutive state of the nation address that has been so disrupted. The man in the eye of the storm is none other than President Jacob Zuma. E.F.F. members say that they will not respect an “illegitimate president” after Mr. Zuma was found to have violated his office by the country’s highest court in 2016. The speaker of the house, Baleka Mbete, called Parliamentary Protection Services in to remove the E.F.F. members after they continually disrupted proceedings, preventing President Zuma from beginning the address. Soon after the E.F.F. was ejected, South Africa’s main opposition party, the Democratic Alliance, staged a walkout, joined by other smaller parties and leaving the president to address a half-empty chamber. Security personnel flooded into the chamber. Chaos erupted, punches got thrown and E.F.F. members were forcibly removed. The E.F.F. members then constantly interrupted Mr. Zuma, demanding that he be seated. For almost an hour opposition politicians in a rather unruly fashion brought various “points of order” to the attention of the speaker of the National Assembly. When the speaker could not get the E.F.F. to allow the president deliver the address, she asked that they be removed. Suddenly security personnel flooded into the chamber. Chaos erupted, punches got thrown and E.F.F. members were forcibly removed. Mr. Zuma watched the violence in the nation’s parliament with, at times, a wry smile on his face. Invited guests, journalists and the international diplomatic corps—among them the papal nuncio to South Africa, Archbishop Peter Wells—witnessed the mayhem. Another altercation occurred outside the parliamentary chamber and, it was reported, that at least one person had to be take away in an ambulance. Once the opposition had been removed, 56 minutes after he was scheduled to begin, Mr. Zuma got up and began his speech as if nothing had happened. The president, with a smile on his face, replied, “For peace’s sake with who?” He went on to suggest that he was not the problem but that the opposition in South Africa wanted to “reduce” the A.N.C., making him the victim of an attack on the party. Several leaders of opposition parties and nongovernmental organizations had raised concerns about an “increased securitization” for the opening of parliament. Several leaders of opposition parties and nongovernmental organizations had raised concerns about an “increased securitization” for the opening of parliament. Ahead of the address, army personnel—with rifles in hand—had lined the streets that the presidential motorcade was to travel. Police in riot gear were visible all around Cape Town. This use of the military generated much discussion in South Africa. The country’s first democratically elected leader, Nelson Mandela, had promised South Africans that the military would never again be used against its own people. It was eerily reminiscent of the nation’s apartheid past to see the military on the streets and sharpshooters on rooftops. The apartheid government had similarly used the military to maintain control. In the days before the address, parliamentary authorities had promised that armed security would not be deployed in the Houses of Parliament. During the opening of parliament, E.F.F. members asked the speaker to confirm that the House of Parliament was a safe place and claimed that security personnel in the parliamentary precinct had been given cable ties and lethal injections to use to control crowds. Members of the D.A. wanted the House to observe a minute of silence for 94 psychiatric patients whose deaths had been linked to negligence by the Gauteng Province’s Department of Health. The speaker did not give the E.F.F. the assurance they wanted nor would she allow the minute of silence to be observed at this joint-sitting of parliament. Mr. Zuma’s presidency has been marred by controversy. Last year, South Africa’s Constitutional Court found that he had violated the Constitution when he used taxpayers’ money to upgrade his own personal residence in Nkandla. The court ordered that he pay back a reasonable amount. In the aftermath of the ruling, opposition parties called for a vote of no-confidence in the president. This measure was voted down—the majority of the members of parliament are from Mr. Zuma’s party, the ruling African National Congress. Mr. Zuma said that white South Africans were earning far more than their black counterparts and that this needs to change, noting that 72 percent of top management in the country was run by whites and that black Africans represented only 10 percent at management levels. He said that a 1.3 percent economic growth was forecast in 2017 but that this was not enough to create jobs. Widespread riots broke out at university campuses across the country in 2016. Mr. Zuma said that his government had responded “caringly and appropriately” to students who had been demonstrating for free education. A Jesuit priest in Johannesburg, Father Graham Pugin, had been shot in the face by riot police during these protests. It was not the president’s speech that dominated the news and breakfast conversation the next morning. It was the violence that the nation, and the world, had witnessed in the same House where Nelson Mandela once stood to deliver a historic state of the nation address. The sanctity of the National Assembly—the heart of South Africa’s democracy—had yet again been violated by violence. And while the nation worried over that disheartening spectacle, Mr. Zuma went off to play golf, joking with media that his game was not the greatest but that as long as he got the ball off the ground and into the air, he would consider himself successful. Russell Pollitt, S.J., is director of the Jesuit Institute South Africa and one of America's Johannesburg correspondents.